This new disc from Albion Records, the label of the Ralph Vaughan Williams Society, offers four works which cover five decades of the composer’s life. They are presented in chronological order and I hope I won’t be thought perverse if I consider the pieces in the reverse of that order: I have my reasons. VW’s Four Last Songs – not a title he gave them - are all settings of poems by his wife, Ursula. In the booklet we read that they were evidently intended for inclusion in two contrasting song-cycles had the composer lived long enough. Only one of the four, Menelaus (1954), was performed publicly in VW’s lifetime. The songs, for voice and piano, were published in 1960 and premiered in that same year by Pamela Bowden. The songs are not all that well known. There have been at least two recordings of them, by Ruth Golden (soprano) (review) and by counter-tenor, Mark Chambers (review); I’ve heard neither of these recordings, both of which use piano accompaniment. The present orchestrations, made by Anthony Payne, were premiered at the 2013 BBC Proms by Jennifer Johnston and the BBC Symphony Orchestra under Osmo Vänskä. It’s excellent that Miss Johnston has been entrusted with the first recording of these songs because she does them really well. In the booklet Anthony Payne comments that the first and fourth songs, Procris and Menelaus both appear to reference the sound-world of the Sinfonia Antartica and the Ninth Symphony whereas in the middle songs, Tired and Hands, Eyes and Heart VW seems to look back to the early lyricism of the Songs of Travel and other songs of that vintage. Indeed, Payne says that in orchestrating those middle two songs he was influenced by the composer’s own scoring of three of the Songs of Travel (review). These are fine songs and it seems to me that Payne has been extremely skilful in his orchestrations. Tired is a lovely offering and the accompaniment in particular seemed to me to hark back to Songs of Travel whereas in Hands, Eyes and Heart it’s the melodic contour of the vocal line that seems suggestive of earlier VW. Menelaus, the final song, appears to me to breathe something of the same air as the Ninth Symphony. I greatly enjoyed hearing these songs in wholly convincing orchestral dress and Jennifer Johnston is an excellent soloist. Her tone is very pleasing indeed and her diction is admirably clear. I think that she identifies very strongly with the songs. Working backwards we come next to Stricken Peninsula. John Francis reminds us in the notes that VW composed music for no fewer than eleven films between 1940 and 1956. With one exception these scores have been performed and recorded in recent years. The exception is the music that VW wrote for the documentary film Stricken Peninsula. This short film depicted the problems encountered by the people of Southern Italy in the closing months of the war. The score has been lost but Philip Lane has reconstructed the music from an audio copy of the film; that must have been a laborious process. I presume that in fashioning the music into a Rhapsody for Orchestra he’s reconstructed VW's scoring as accurately as possible. What I don’t know is how much re-ordering of the material has taken place. There are some good ideas in this score. Chief among these is the Main Theme which is heard near the start (0:15) in quite a restrained fashion on the woodwind. Towards the end (7:12) the theme returns in a much enhanced scoring and now the music sounds grand and positive. Earlier Philip Lane treats us to what he calls “probably the only example in the whole RVW oeuvre of an Italian marching band.” This is a suitably jaunty episode. I wouldn’t say that this score is a hugely significant addition to our knowledge of the composer but Philip Lane has done a sterling job and it’s very good that all of VW’s work for the cinema can now be heard. The Poisoned Kiss was the third of Vaughan Williams’s full operas, coming after Hugh the Drover and Sir John in Love. It is probably his most neglected stage work. As Stephen Connock wrote in his notes for the work’s only recording, much of the reason for the neglect must surely lie with what he termed its “rather dated and contrived text” which was the work of Evelyn Sharp. The score was recorded by Richard Hickox in 2003 (review) and it’s a splendid account of the piece but I have to admit that it’s quite some time since I listened to it and the rather precious nature of the libretto is a deterrent for me. I’m wrong to feel that way, I know, because the music is unfailingly attractive and inventive. Now Adrian Williams has extracted nearly half an hour of music from the score – which runs for 116 minutes in the Hickox recording – and woven it into a Symphonic Rhapsody for orchestra. The result is a delight. The Rhapsody is jam-packed with glorious melodies, colourfully scored. At the heart of this orchestral work lies music from the key section of Act II when the heroine, Tormentilla, kisses the hero, Amaryllus. For reasons too complicated to discuss here her kiss is poisonous and so she brings about his apparent demise – though he is not, in fact, dead and all ends happily. In this section there’s an abundance of generous romantic music and the whole is splendidly played by the BBCSO – special mention for the delectable cello and violin solos. After the apparent demise of Amaryllus Adrian Williams cuts straight from that sad passage to the ebullience of the happy ending in Act III. Adrian Williams has produced an absolutely winning concert score here and I hope it will be taken up by orchestras. It does for The Poisoned Kiss what the realisation by Martin Yates of Fat Knight did for Sir John in Love (review). Both of these concert pieces enable audiences to hear truly attractive music from these two operas and, if they don’t already know the full scores, may persuade them to explore the operas. I can certainly say that Adrian Williams has rekindled my appetite to hear The Poisoned Kiss again, especially after hearing this sparkling rendition from Martyn Brabbins and the BBCSO. I said I had a reason for discussing this programme in reverse chronological order. All the music on this CD has been ear-opening but the real revelation is the Three Nocturnes for Baritone and Orchestra. These were written in 1908 around the time of VW’s brief studies with Ravel. In fact the first and third are both dated shortly after those studies had finished but the second one is dated 11 January 1908, during the Ravel period. Anthony Payne relates in the booklet that Ursula Vaughan Williams deposited the manuscripts of Nocturnes I and III with the British Library, where they lay largely undisturbed, it seems. It was only in 2000 that the manuscript of Nocturne II came to light; it had been included in the papers of the English baritone and composer, Frederic Austin (1872-1952). That Nocturne, discovered by Austin’s grandson, was in full score and I understand that Richard Hickox recorded it in 2003 though I don’t believe I’ve heard it. Following the success of his orchestrations of the Four Last Songs Anthony Payne was asked to do a similar task on the two un-orchestrated Nocturnes. It’s indicative of how impressed he was by the music that he was prepared to set aside work on the major commission he’d been given to write a choral-orchestral work for the 2016 Proms in honour of his 80th birthday in order to score VW’s Nocturnes. In passing it’s interesting to note that the Proms premiere of Payne’s own piece, Of Land Sea and Sky was given in a programme that also included VW’s Toward the Unknown Region (review). Few who heard that concert would have realised how apt it was for those two scores to be juxtaposed given that Payne had been orchestrating the Nocturnes, which are almost contemporaneous with Toward the Unknown Region. The Nocturnes are all settings of Vaughan Williams’s great source of inspiration, Walt Whitman. The first, Smile, O Voluptuous Cool-Breath’d Earth is ecstatic and visionary in tone, VW matching Whitman’s sentiments with acute responsiveness to the words. The vocal tessitura is often high-lying and Roderick Williams, as so often in my experience, produces glorious high notes, seemingly without any effort. The orchestration is wonderful; sample the marvellously atmospheric orchestral conclusion after the singer has finished. Then comes Whispers of Heavenly Death in the composer’s own scoring. This, Anthony Payne, suggests, is a final demonstration of VW’s pre-Ravel style. That is probably true but I think he is audibly on the cusp of what was soon to follow. The music put me in mind of Toward the Unknown Region, especially at ‘I see, just see, skyward, great cloud-masses’. Even more I’m reminded of ‘On the Beach at Night alone’ from Sea Symphony. The music is mainly delicate and mysterious and Roderick Williams, who is so fine in Sea Symphony (review), is an ideal interpreter. The last and longest Nocturne is Out of the Rolling Ocean. The orchestral opening, with its memorable horn solo, could come right out of the pages of the ‘London’ or 'Pastoral' symphonies, especially as presented in the informed and sensitive Payne scoring. The Nocturne is full of intense, rapturous music and the vocal line is a gift for Roderick Williams who sings the piece most expressively. 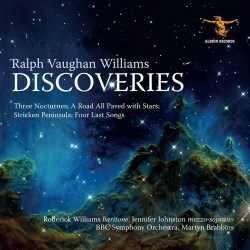 This trio of Nocturnes is a major and exciting addition to the Vaughan Williams discography. Throughout the programme Martyn Brabbins conducts with great understanding and empathy for VW’s music. I don’t know if financial considerations will allow but it would be wonderful if, now that he is Music Director of ENO, he would lead a revival of Pilgrim’s Progress, which he conducted there so memorably in 2012 (review). The BBC Symphony Orchestra is on top form for him and offers truly accomplished and sensitive playing. The production values are very high. The recordings have been engineered with great skill by Simon Hancock (A Road all Paved with Stars) and Neil Pemberton. The excellent notes are by John Francis with very valuable interpolations by the three composers who have brought the music to life on this disc. I have heard the majority of Albion Records CDs to date and they have issued many valuable releases which have expanded our knowledge of Vaughan Williams. However, I’m inclined to think this is one of their most important releases to date. All devotees of this great composer will want to hear it but the Three Nocturnes make it a mandatory purchase.